This dashboard was created as a hack-a-thon project to provide our clients with a quick and easy solution for seeing how they stack up against their competitors. Our goal for this project was to turn "boring" data into something fun and engaging, so we came up with the idea to design this head-to-head comparison dashboard using common themes found in fantasy football to really emphasize the competitive spirit. Whirlpool saw our demo, and loved it. Their excitement eventually led to us building this into a fully-functional dashboard for them to display within their headquarters on large monitors to help get their internal teams excited about user generated content for their products. In this screenshot, the user is viewing details for Review Volume for a total of 7 days. The table shows the client (Whirlpool) how they compare to their competitor (GE) for: review volume, overall average rating, total number of products reviewed, total number of reviews per product, and how many of those categories they are "winning" in compared to the competition. The bar chart to the right shows a visual comparison of the client's results with their competitor, as well as a line to indicate the industry average. The "alerts" on the bottom right are intended to surface key insights for the client on their performance, as well as their competitor's, and offers some solutions for improving their results. 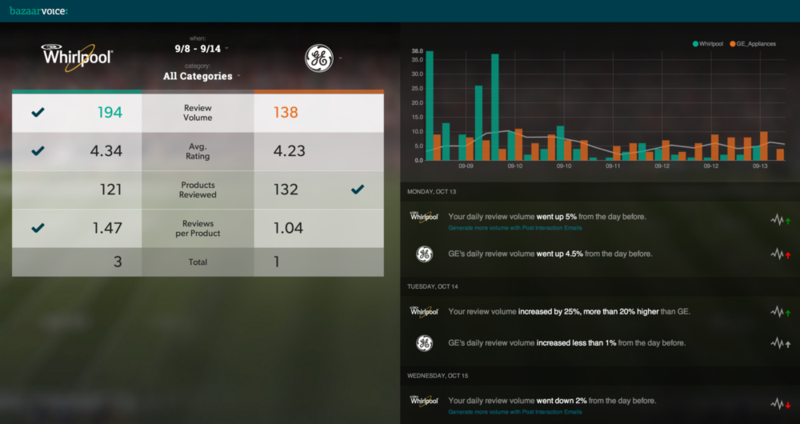 Detail of the table, showing Reviews per Product selected, which will filter the bar chart and alerts feed to be specific to just this one metric. Detail of the bar chart comparing results for Whirlpool and GE Appliances. The line on this chart indicates the industry average. Detail of the alerts feed. In this example, the user has not selected any specific metric in the table on the top left of the dashboard, therefore, they will see all alerts in the feed. For this project, I worked on a team with a Senior Front End Developer and another User Experience Designer. My main responsibilities were UI Design, UX Design, and Product Management (past the hack-a-thon). A vast majority of our work for this project was done within 24 hours, during the hack-a-thon. In addition to Whirlpool requesting we build this into a "real" product for them, which is rewarding on its own, we also won the Peoples' Choice award, nominated by our peers as best-in-show for the Bazaarvoice Hacktoberfest. Collecting our prizes for the Peoples' Choice award.